Gentrification. Those of us who work in water cities and towns inevitably encounter it. To have a positive impact on the communities where we work, we must discuss what gentrification means, analyze our own role in the process, and come up with solutions. Groundwork Hudson Valley Daylighting Project along the Sawmill River, Hudson Valley, NY. I worked for Groundwork New Orleans for over five years and now work for Groundwork USA. The over twenty Groundwork trusts work to “bring about the sustained regeneration, improvement, and management of the physical environment by developing community-based partnerships that empower people, businesses, and organizations to promote environmental, economic, and social well-being”. Or, in more succinct terms, the trusts work to change both lives and places by connecting people with the places where they live. The Groundwork tag line is: changing places, changing lives. This is a powerful idea, resulting in projects that have real and measurable impacts on the lives of youth and adults throughout the country. Groundwork affiliates often work in underserved or environmental justice communities. In many cases this means we’re working alongside people who have claimed a seat at the decision-making table in spite of being the ones most affected by pollution, overdevelopment, and other environmental and health issues. Through their own efforts, these communities may now have healthier water, better recreation opportunities, and access to economic and educational opportunities. However, our work is inseparable from the business of “greening” and cleaning up spaces. Revitalization is a buzz word, and also an industry, and in many cases, results in skyrocketing property values and incursion of development interests. 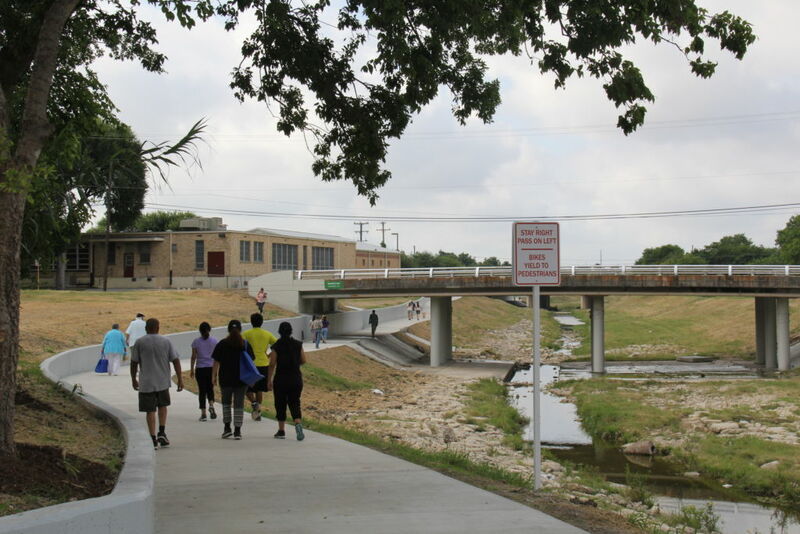 This can result in the displacement of the very community members who would otherwise benefit from the improved health and recreation opportunities brought about by revitalization. Residents walk along the Alazan Creek Trail in San Antonio, TX. For whom are we changing places? Whose lives are we changing, and how? How can we ensure that communities benefit from the changes they work to bring about? This is not to say that change is in itself a problem, to be feared and avoided. And I would certainly never argue that we shouldn’t work to improve people’s health and quality of life. Rather, I urge us to be intentional in our practice and consider the long-term consequences of our work. If those long-term consequences don’t fit with our goals and mission, we must look at the situation critically and do things differently. 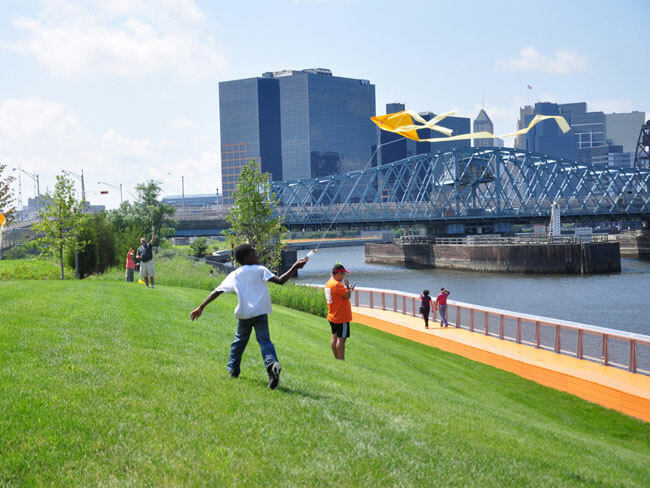 Children fly kites in a riverside park in Newark, NJ. Photo provided by Ironbound Community Corp. The data on gentrification and displacement are varied and complicated. It can’t be said that gentrification happens the same way every time, or that communities never benefit. But those of us who work in the field regularly encounter real people who live through the experience of displacement as a result of neighborhood revitalization efforts. In many cases, they are forced out of their homes, and have to relocate to neighborhoods with less amenities and more environmental hazards. In other words, poverty just gets moved elsewhere — and is intensified. Aside from the direct impact displacement has on individuals and families, some evidence—like this study in Philadelphia—suggests that entire cities and towns suffer over time, even if displacement rates in gentrified areas are low. When one neighborhood becomes the central focus of development and revitalization, other neighborhoods may be further neglected as they lose businesses and property values fall. In these neighborhoods, poverty can concentrate and intensify. In the long run, even gentrified neighborhoods may suffer. Surrounded by neighborhoods in decline, and with culture bearers—such as artists, musicians, and service industry professionals—being forced out, gentrified neighborhoods no longer support the rich arts and culture that attracted people in the first place, and eventually, people leave again until the neighborhood once more falls into decline. This pattern, where it exists, does not benefit anyone in the long run. If we are to develop a more sustainable practice of “greening” places—one that has a real impact on generations to come, and produces long-term sustainable economies—we will need to study these processes more, understand them better, and develop more solutions. Many environmental organizations rely on volunteer labor to “green” spaces. However, sometimes it is possible to directly benefit the local economy and provide jobs to local residents. This furthers the impact of the work and is an effective form of community engagement. Employment can be provided through job training programs for youth (such as the Groundwork Green Teams) and citizen science programs for adults. 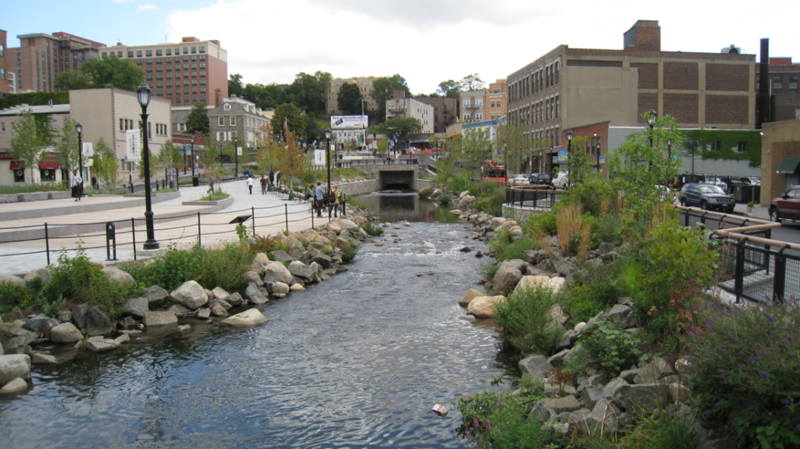 Some “greening” projects are heavily design-driven without taking into account local histories, cultures, and existing uses. 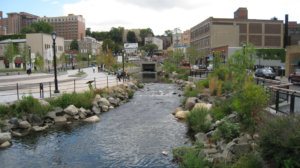 Green infrastructure can be as guilty of this as a golf course, by employing the most modern designs without taking local uses and art forms into account. In many cases it is much more beneficial to involve local schools and artists in the development of the look and feel of a place. Incorporating monuments to local leaders and other nods to history is an important way of using design to entrench local culture, rather than displacing it. Observing how people already use a space, and enhancing those uses, is a powerful way to make a place better for the people that live there. For example, existing walking trails or soccer fields can be incorporated into designs. Green spaces can be used to provide recreational space for things locals already do — like skateboarding. Neighborhoods can be connected along a green space by improving commuting routes—and safe access points—for pedestrians and cyclists. We often work to change public spaces; however, “greening” schools, community centers, libraries, and other spaces that serve locals is one way to ensure that the people who live there are the ones who benefit most directly. At the Urban Waters Learning Network, we are currently working to better understand our impacts on gentrification, and how we can be more intentional about our role in the process. What have you learned from your encounters, failures, and successes? If you have experiences and/or resources to share, please comment below or reach out to me directly by email. We would love to hear from you. Ding, Lei; Jackelyn Hwang; and Eileen Divringi. “Gentrification and Residential Mobility in Philadelphia.” Federal Reserve Bank of Philadelphia and Princeton University, Sept. 2016. Florida, Richard.“The Closest Look Yet at Gentrification and Displacement.” City Lab, Nov. 2, 2015. Haffner, Jeanne.“The Dangers of Eco-gentrification: What’s the Best Way to Make a City Greener?” The Guardian, May 6, 2015. 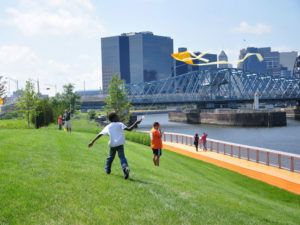 Jaffe, Eric.“How Parks Gentrify Neighborhoods — and How to Stop It.” Co-Design. May 6, 2015. PBS.“Beyond Gentrification: Roundtable of Experts.” June 17, 2003. Rice, Zak Cheney. “These Seven Cities Expose Exactly What Gentification is Doing to America.” Mic, Oct. 22, 2014.